For the German fighter ace, see Hans-Dieter Frank. Hans Michael Frank (23 May 1900 – 16 October 1946) was a German lawyer who worked for the Nazi Party during the 1920s and 1930s, and later became Hitler's personal lawyer. 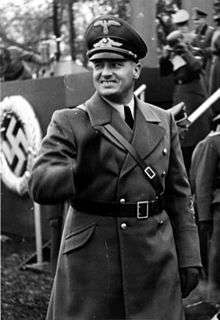 After the invasion of Poland, Frank became Nazi Germany's chief jurist in the occupied Poland "General Government" territory. During his tenure throughout World War II (1939–45), he instituted a reign of terror against the civilian population and became directly involved in the mass murder of Jews. At the Nuremberg trials, he was found guilty of war crimes and crimes against humanity and was executed. Frank, the middle child of three, was born in Karlsruhe to Karl Frank, a lawyer, and his wife, Magdalena (née Buchmaier), a daughter of a prosperous baker. He graduated from high school at the renowned Maximilians gymnasium in Munich, and right after, at seventeen, joined the German army fighting in World War I, barely reaching front line combat. After the war, in 1919 and 1920, he was a member of the Thule völkisch society. He served also in the Freikorps under Franz Ritter von Epp's command, taking part in the crackdown of the Münchner Räterepublik. In 1919, as did other members of the Thule society, he joined the German Workers' Party (DAP) at its very beginning. Although the DAP evolved quite soon into NSDAP (the Nazi party), Frank joined the Nazi movement only in September 1923, when he became a member of the Sturmabteilung (SA), and in October by signing up for the Nazi party itself. In November of the same year, Frank took part in the Beer Hall Putsch, the failed coup attempt intended to parallel Mussolini's March on Rome. In the aftermath of the attempted putsch, Frank fled to Austria returning in Munich only in 1924, after the pending legal proceedings were stayed. Frank studied law (he passed the final state examination in 1926) and rose to become Adolf Hitler's personal legal adviser. As the Nazis rose to power, Frank also served as the party's lawyer. He represented it in over 2,400 cases and spent over $10,000. This sometimes brought him into conflict with other lawyers. Once, a former teacher, appealed to him: "I beg you to leave these people alone! No good will come of it! Political movements that begin in the criminal courts will end in the criminal courts!" In September–October 1930, Frank served as the defence lawyer at the court-martial in Leipzig of Lieutenants Richard Scheringer, Hans Friedrich Wendt and Hanns Ludin, three Reichswehr officers charged with membership in the NSDAP. The trial was a media sensation. Hitler himself testified and the defence successfully put the Weimar Republic itself on trial. Many Army officers developed a sympathetic view of the National Socialist movement as a consequence. Frank was elected to the Reichstag in 1930, and in 1933 he was made Minister of Justice for Bavaria. From 1933, he was also the head of the National Socialist Jurists Association and President of the Academy of German Law. Frank objected to extrajudicial killings as it weakened the power of the legal system (of which he himself was a prominent member), both at the Dachau concentration camp and during the Night of the Long Knives. [The judge's] role is to safeguard the concrete order of the racial community, to eliminate dangerous elements, to prosecute all acts harmful to the community, and to arbitrate in disagreements between members of the community. The National Socialist ideology, especially as expressed in the Party programme and in the speeches of our Leader, is the basis for interpreting legal sources. From 1934, Frank was Reich Minister Without Portfolio. On 7 April 1938, Frank addressed some 10,000 National Socialists at the Passau Nibelungenhalle. In September 1939 Frank was assigned as Chief of Administration to Gerd von Rundstedt in the German military administration in occupied Poland. Beginning 26 October 1939, following the end of the invasion of Poland, Frank was assigned Governor-General of the occupied Polish territories (Generalgouverneur für die besetzten polnischen Gebiete), controlling the General Government, the area of Poland not directly incorporated into Germany (roughly 90,000 km2 out of the 187,000 km2 Germany had gained). Frank oversaw the segregation of the Jews into ghettos, especially the enormous Warsaw ghetto, and the use of Polish civilians as forced labour. In 1942 he lost his positions of authority outside the General Government after annoying Hitler with a series of speeches in Berlin, Vienna, Heidelberg, and Munich and also as part of a power struggle with Friedrich Wilhelm Krüger, the State Secretary for Security – head of the SS and the police in the General Government. Krüger himself was ultimately replaced by Wilhelm Koppe. A great Jewish migration will begin in any case. But what should we do with the Jews? Do you think they will be settled in Ostland, in villages? We were told in Berlin, 'Why all this bother? We can do nothing with them either in Ostland or in the Reichskommissariat. So liquidate them yourselves.' Gentlemen, I must ask you to rid yourself of all feelings of pity. We must annihilate the Jews wherever we find them and whenever it is possible. One has to take the diary as a whole. You can not go through 43 volumes and pick out single sentences and separate them from their context. I would like to say here that I do not want to argue or quibble about individual phrases. It was a wild and stormy period filled with terrible passions, and when a whole country is on fire and a life and death struggle is going on, such words may easily be used... Some of the words are terrible. I myself must admit that I was shocked at many of the words which I had used. An assassination attempt by Polish Secret State on 29/30 January 1944 (the night preceding the 11th anniversary of Hitler's appointment as Chancellor of Germany) in Szarów near Kraków failed. A special train with Frank traveling to Lviv was derailed after an explosive device discharged but no one was killed. 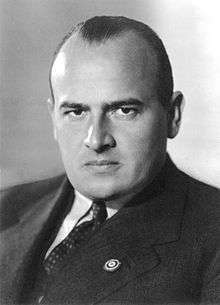 Hans Frank patronized the General Government chess tournaments (1940–1944) which started in the context of a chess congress held in Kraków in 1940. The General Government was the location of four of the six extermination camps, namely, Bełżec, Treblinka, Majdanek and Sobibór. Chełmno and Birkenau fell just outside the borders of the General Government. Frank later claimed that the extermination of Jews was entirely controlled by Heinrich Himmler and the SS and that he, Frank, was unaware of the extermination camps in the General Government until early in 1944, a surprising claim and one found to be untrue by the Nuremberg tribunal. During his testimony at Nuremberg, Frank claimed he submitted resignation requests to Hitler on 14 occasions, but Hitler would not allow him to resign. Frank fled the General Government in January 1945 as the Soviet Army advanced. Frank was captured by American troops on 3 May 1945, at Tegernsee in southern Bavaria. He attempted suicide twice but failed both times. He was indicted for war crimes and tried before the International Military Tribunal in Nuremberg from 20 November 1945 to 1 October 1946. During the trial he converted, guided by Fr Sixtus O'Connor OFM, to Roman Catholicism, and claimed to have had a series of religious experiences. after having heard the testimony of the witness Rudolf Höss, my conscience does not allow me to throw the responsibility solely on these minor people. I myself have never installed an extermination camp for Jews, or promoted the existence of such camps; but if Adolf Hitler personally has laid that dreadful responsibility on his people, then it is mine too, for we have fought against Jewry for years; and we have indulged in the most horrible utterances. Hans Frank was next in the parade of death. He was the only one of the condemned to enter the chamber with a smile on his countenance. And, although nervous and swallowing frequently, this man, who was converted to Roman Catholicism after his arrest, gave the appearance of being relieved at the prospect of atoning for his evil deeds. He answered to his name quietly and when asked for any last statement, he replied "I am thankful for the kind treatment during my captivity and I ask God to accept me with mercy." His body and those of the other nine executed prisoners and the corpse of Hermann Göring were cremated at Ostfriedhof (Munich) and the ashes were scattered in the river Isar. While awaiting execution, he wrote his memoirs. In the capacity as his attorney, Frank was privy to personal details of Hitler's life. In his memoirs, written shortly before his execution, Frank made the sensational claim that Hitler had commissioned him to investigate Hitler's family in 1930 after a "blackmail letter" had been received from Hitler's nephew, William Patrick Hitler, who allegedly threatened to reveal embarrassing facts about his uncle's ancestry. Frank said that the investigation uncovered evidence that Maria Schicklgruber, Hitler's paternal grandmother, had been working as a cook in the household of a Jewish man named Leopold Frankenberger before she gave birth to Hitler's father, Alois, out of wedlock. Frank claimed that he had obtained from a relative of Hitler's by marriage a collection of letters between Maria Schicklgruber and a member of the Frankenberger family that discussed a stipend for her after she left the family's employ. According to Frank, Hitler told him that the letters did not prove that the Frankenberger son was his grandfather but rather his grandmother had merely extorted money from Frankenberger by threatening to claim his paternity of her illegitimate child. Frank accepted this explanation, but added that it was still just possible that Hitler had some Jewish ancestry. But he thought it unlikely because, "...from his entire demeanor, the fact that Adolf Hitler had no Jewish blood coursing through his veins seems so clearly evident that nothing more need be said on this." Given that all Jews had been expelled from the province of Styria (which includes Graz) in the 15th century and were not allowed to return until the 1860s, scholars such as Sir Ian Kershaw and Brigitte Hamann dismiss as baseless the Frankenberger hypothesis, which before had only Frank's speculation to support it. There is no evidence outside of Frank's statements for the existence of a "Leopold Frankenberger" living in Graz in the 1830s, and Frank's story is notably inaccurate on several points such as the claim that Maria Schicklgruber came from "Leonding near Linz", when in fact she came from the hamlet of Strones near the village of Döllersheim. Some suggest that Frank (who turned against National Socialism after 1945 but remained an anti-Semitic fanatic) made the claim that Hitler had Jewish ancestry as way of proving that Hitler was really a "Jew" and not an "Aryan"; and in this way, "proved" that the Third Reich's crimes were the work of the "Jewish" Hitler. The full anti-Semitic implications of Frank's story were borne out in a letter entitled "Was Hitler a Jew? ", written to the editor of a Saudi newspaper in 1982 by a German man living in Saudi Arabia. The writer accepted Frank's story as the truth, and added since Hitler was a Jew, "the Jews should pay Germans reparations for the War, because one of theirs caused the destruction of Germany". On the other hand, a different version of Frank emerges in the brilliantly vicious, utterly unforgiving portrait of him by his son, Niklas Frank, who (in a memoir called In the Shadow of the Reich) depicts his father as a craven coward and weakling, but one not without a kind of animal cunning, an instinct for lying, insinuation, self-aggrandizement. For this Hans Frank, disgraced and facing death on the gallows for following Hitler, fabricating such a story might be a cunning way of ensuring his place in history as the one man who gave the world the hidden key to the mystery of Hitler's psyche. While at the same time, revenging himself on his former master for having led him to this end by foisting a sordid and humiliating explanation of Hitler on him for all posterity. In any case, it was one Frank knew the victors would find seductive. Brigitte Frank had a reputation for having a more dominant personality than her husband: after 1939 she called herself "a queen of Poland" ("Königin von Polen"). The marriage was unhappy and became colder from year to year. When Frank sought a divorce in 1942, Brigitte gave everything to save their marriage in order to remain the "First Lady in the General Government". One of her most famous comments was "I'd rather be widowed than divorced from a Reichsminister!" Frank answered: "So you are my deadly enemy!" In 1987, Niklas Frank wrote a book about his father, Der Vater: Eine Abrechnung ("The Father: A Settling of Accounts"), which was published in English in 1991 as In the Shadow of the Reich. The book, which was serialized in the magazine Stern, caused controversy in Germany because of the scathing way in which the younger Frank depicted his father: Niklas referred to him as "a slime-hole of a Hitler fanatic" and questioned his remorse before his execution. Niklas is the sole living child of Hans and Brigitte Frank. Sigrid remained a committed Nazi who emigrated to South Africa during the apartheid regime and died there. Brigitte committed suicide in 1981; Michael and Norman died in 1990 and 2010, respectively. If I had to order a distribution of posters announcing such an event every time I order a shooting of seven Poles, there would not be enough trees in the Polish forests to supply the necessary paper. A thousand years will pass and still Germany's guilt will not have been erased. There is still one statement of mine which I must rectify. On the witness stand I said that a thousand years would not suffice to erase the guilt brought upon our people because of Hitler's conduct in this war. Every possible guilt incurred by our nation has already been completely wiped out today, not only by the conduct of our war-time enemies towards our nation and its soldiers, which has been carefully kept out of this Trial, but also by the tremendous mass crimes of the most frightful sort which—as I have now learned—have been and still are being committed against Germans by Russians, Poles, and Czechs, especially in East Prussia, Silesia, Pomerania, and Sudetenland. Who shall ever judge these crimes against the German people?" Hans Frank has been portrayed by the following actors in film, television and theater productions. Lothar Bellag in the 1968 East German television miniseries Wege übers Land. Andreas Conrad in the 2005 German T.V. miniseries Speer und Er. Curzio Malaparte, an Italian writer who during the war also served as a reservist Italian army officer, and unofficial diplomat because of his ties with Germany, wrote extensively in his 1944 book Kaputt! about Frank and the convivial dinners that he held in his mansions outside Warsaw and Cracow for Malaparte and other guests. He also mentions that Frank was a capable piano player. ↑ "Holocaust Encyclopedia: Hans Frank". United States Holocaust Memorial Museum. Retrieved 18 April 2016. 1 2 Geiss, Immanuel; Jacobmeyer, Wolfgang, eds. (1980). Deutsche Politik in Polen 1939-1945. Aus dem Diensttagebuch von Hans Frank, Generalgouverneur in Polen (in German). Opladen: Leske + Budrich. p. 11. ISBN 978-3810002969. 1 2 3 4 Frank's cross-examination during the Nuremberg trial in: "One Hundred And Eleventh Day - Thursday, 18 April 1946". Nuremberg Trial Proceedings. 12. Yale Law School/Lillian Goldman Law Library/The Avalon Project. p. 20. Retrieved 18 April 2016. ↑ Evans, Richard J. (2004). The Coming of the Third Reich. Penguin Press, p. 179; ISBN 978-1-59420-004-5. 1 2 Wheeler-Bennett, John (1967). The Nemesis of Power, London: Macmillan, pp. 216-20. ↑ Housden, Martyn (2003). Hans Frank, Lebensraum and the Final Solution. Palgrave Macmillan. p. 4. ISBN 978-1403915795. ↑ Quoted in Evans, Richard J. (2005). The Third Reich in Power. Penguin Press, p. 73. ISBN 978-1-59420-074-8. ↑ Anna Rosmus Hitlers Nibelungen, Samples Grafenau 2015, p. 145. ↑ Speech by Frank to his senior officials, 16 Dec 1941, repr. in: Office of Chief Counsel for Prosecution of Axis Criminality, OCCPAC, quoted in Polonsky, Antony (2011). The Jews in Poland and Russia. III 1914 to 2008. p. 434. ↑ Wroński, T. (1974). Kronika okupowanego Krakowa. Wydawnictwo Literackie, p. 320. ↑ Dąbrowa-Kostka, S. (1972). W okupowanym Krakowie. Wydawnictwo Ministerstwa Obrony Narodowej, pp. 160–67. ↑ Winter, Edward (2013). "Hans Frank and Chess". chesshistory.com. Retrieved 18 April 2016. ↑ Gilbert, G. M. (1995). Nuremberg Diary. De Capo Press, p. 19; ISBN 978-0-306-80661-2. 1 2 Smith, Kingsbury (16 October 1946). "The Execution of Nazi War Criminals". Famous World Trials - Nuremberg Trials 1945-1949. Retrieved 18 April 2016. ↑ Rosenbaum, Ron (1998). Explaining Hitler. New York: Random House. pp. 21–22. ↑ Translated from Frank's memoirs published posthumously: Frank, Hans (1953). Im Angesicht des Galgens. Deutung Hitlers und seiner Zeit aufgrund eigener Erlebnisse und Erkenntnisse. Friedrich Alfred Beck. p. 330 (in German). ↑ "Hatte Hitler jüdische Vorfahren?" (in German). Holocaust-Referenz. Retrieved 18 April 2016. "Was Hitler part Jewish?". The Straight Dope. 9 April 1993. "Was Hitler Jewish?". Jewish Virtual Library. Retrieved 18 April 2016. ↑ Rosenbaum 1998, p. 21. ↑ Rosenbaum 1998, pp. 21, 30-1. ↑ Rosenbaum 1998, p. 30. ↑ Rosenbaum 1998, p. 31. ↑ Rosenbaum 1998, p. 25. ↑ "Hans Frank – Pre-war career, Wartime career, Quotation, Fiction and film," in Cambridge Encyclopedia, 32. Retrieved 20 January 2008. ↑ Frank, Niklas (1991). In the Shadow of the Reich. Knopf; ISBN 978-0-394-58345-7. ↑ Review by Susan Benesch, Washington Monthly, November 1991. ↑ Niklas Frank, Hitler's Children (2012 documentary). ↑ Cited in Davies, N. (2003). Rising '44. London: Macmillan. p. 84; ISBN 978-0-333-90568-5. ↑ Czapski, J. (1987). The Inhuman Land. London: Polish Cultural Foundation. p. 306. ISBN 978-0-85065-164-5. ↑ William L. Shirer. The Rise and Fall of the Third Reich (foreword). Simon and Schuster, New York, 1960. ↑ "Two Hundred And Sixteenth Day - Saturday, 31 August 1946". Nuremberg Trial Proceedings. 22. Yale Law School/Lillian Goldman Law Library/The Avalon Project. p. 385. Retrieved 18 April 2016. ↑ Hans Frank (Character) at the Internet Movie Database. Fest, Joachim C. and Bullock, Michael (trans.) "Hans Frank - Imitation of a Man of Violence" in The Face of the Third Reich New York: Penguin, 1979 (orig. published in German in 1963), pp. 315–331. ISBN 978-0201407143. "The International Military Tribunal for Germany". Yale Law School / Lillian Goldman Law Library / The Avalon Project.